We are committed to provide you with the care you need & deserve. Since no two people are alike, our agency conducts a confidential, in-home consultation to gain a better understanding of you and your families specific needs and expectations. Our certified caregivers are experienced and trained through rigorous and in-depth lessons taught by a Quire Training Solutions. We also screen our caregivers carefully so you’ll be able to trust that you are getting the best possible assistance. “Family Learning Center”: We also offer over 40 complimentary online courses geared for family members and family caregivers who just want to better understand the process of aging, communication, diseases, memory loss, and other health factors. Caring is more than just a job for us. Loudoun Home Care is a member of Companion Connection Senior care, a national membership organization of home care agencies. All members have access to recognized experts in the field of home care, as well as the most current educational resources, which enable them to provide the highest level of care to their customers. Veterans Benefits for Home Care. 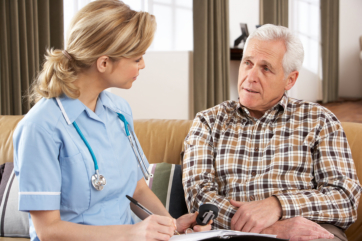 Loudoun Home Care is Licensed, Bonded and Insured. Refer to Angie’s list and have more testimonies about LHC.